Submitted by Migrate Wizard on 2015-05-27 11:34. Setting Vast game world spans all settings. Gameplay Length Amon is designed to take a player from level 1 through 40. Completing the world is an epic task. Number Players Amon can support as many players as your hardware can support. *Updated 5-9-09 per advice from CTP Team, I have removed the unneeded ctp_bio_fix hak. The World of Amon at its heart is an epic love story. Players are invited to right the horrible wrongs that spawned the very society they awake into. Players will journey over four continents and beyond to reunite the sundered lovers Amon and Alise. The free people of Aikolund hang by a thread, and players are awoken in hopes that they might aid them in their cause. On 9-10-09 I officially turned off all the World of Amon computers. This page will be the final resting place for my work. I will miss having it there to log into and remember, but four servers is a bit much to run 24/7 to cling to what was. My thanks to all those that encouraged, helped, tested, inspired, and influenced the creation of Amon. I wrote Amon to bring friends together, and that is my greatest hope for its release. Thanks so much for this, me and some freinds want to relive the glory days in our favorite world! Currently being hosted by "DMShoric" on his own server. Look for us on NWNList Scry. Currently being hosted on NWN EE. 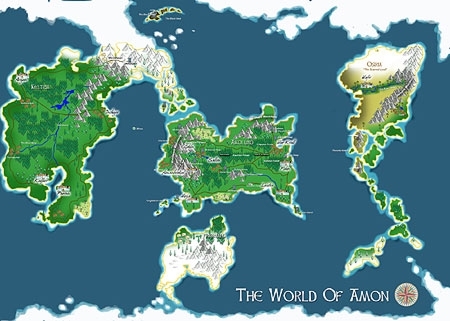 The one Shoric has been hosting is titled World of Amon Since 2015. I beleive the "Official" one is using the same file, but just started hosting it. Not clear on what the Official is about, but it's not Ren. If anyone knows where Ren is, tell him we would love to host (or just play on) his materialized dream.